This pair is very similar to the GEO Angel Browns, with tiny variations in pattern and colour. In fact I quite like this pair, and will probably repurchase these instead of the Angel Browns because I like the bigger diameter and lighter colour. Random pic! Nerd glasses! I borrowed these from my brother's room~ My falsies are way too long, so I can't wear these comfortably 0_o But you can see here how the lenses look almost yellow in this lighting. Thanks for the review! I love the ankle boots you have, and the necklace. I wholly expected it to read 'I Love You' but was surprised to see 'Hate' instead, but in a way it's funny like that! Super pretty!!! Love the dress as well! Your lenses are so pretty! Love your eye makeup in this review. You eyes look so big! The color looks like a really nice golden brown. Also love the floral dress you are wearing!! I have the geo angel browns and love them, these do look similar but I think I'll stick with the geo angels since I don't want anymore enlargement that 14mm. But those do give you such cute dollie eyes and you definitely can pull off the big nerd glasses, you look great in them! Cute OOTD , the floral mini dress is my type of dress and that necklace is wicked cute! Your eyes are gorgeous! 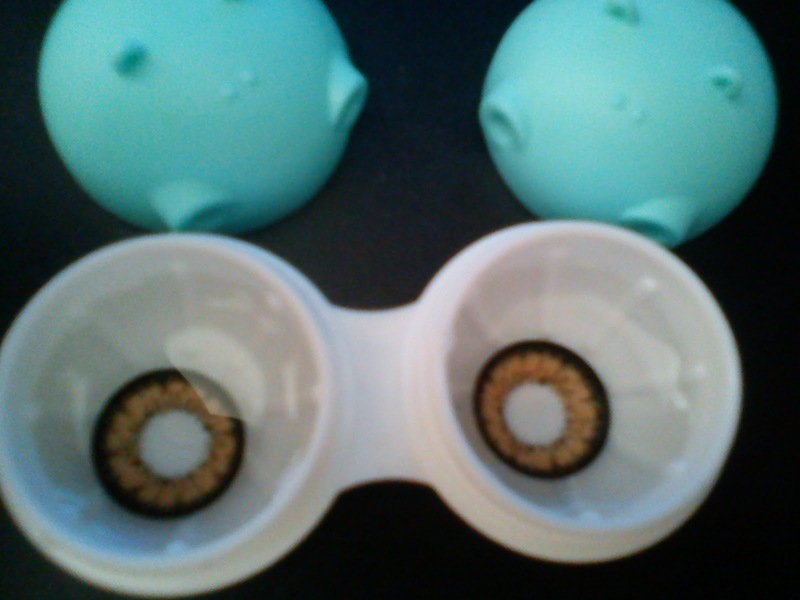 Is your contact lens case little piglets? Ah, good to see a new post from you girly:) Everyone keeps posting amazingly adorable circle lens reviews and I don't know what to choose for my next pair! hahaha. I must say you are terrific at applying those bottom false lashes though...I bought my first pair recently and it was horrible. haha. I really stink at applying. Which brand do you recommend? with these you look like a doll! Great review dear, thanks for sharing :) I have this lens too ^^ Thank you for your lovely comment on my blog.. The angel browns are great for a natural look, super easy to wear with and without make-up. I hate that I can't wear falsies with my glasses since I try to give my eyes a rest from contacts a couple days each week! I know, it's so hard to choose which lenses to buy, I want to try them all! Haha, I'm glad the lower lashes look okay, they are difficult to apply but practice makes perfect. I only started using them last Nov/Dec so I recommend practising as much as possible - add more lash glue because one or both of the ends tends to 'pop' back up up, use tweezers to help with precision, place them under the real lashes (and leave more space for eyeliner if you want a heavier make-up look). I recommend practising with the cheap Taiwan falsies from ebay (10 pairs for about $2-3). I just cut them up and experiment with different lengths along the lash line to see what suits. Your makeup looks great!! I really like hoe these lenses look, I will definitely keep them in mind when it's time for me to repurchase my circle lenses. We are running a free circle lens giveaway contest. Cute blog! I always want to wear circle lenses but I'm blind so I need prescription contacts instead!